What role do our memories play in our day-to-day lives? How do our pasts define or contribute to who we are today? How might a quest or an adventure deepen our connection to our true hearts? The Wanderer stands out to me for many reasons, but two are primary. First, the story is very clearly a hero’s journey. It’s set in the here and now, but has that epic journey feel. In some seasons, the best thing for our emotional growth might be to leave our everyday lives and venture out. Our journey might take us across the sea, as in The Wanderer, along the Pacific Crest Trail, or even on a trek through a distant country. Even when a quest isn’t possible, we can build the emotional equivalent by taking on a new challenge. We might choose a learning or creative challenge. What’s important is that we choose a true stretch that engages us on a practical level and as an emotional one. While on a personal quest, books such as The Wanderer can heighten our experience. They add an epic undercurrent to otherwise ordinary-feeling days. Cognitive scientists have discovered that when we read, listen to, or watch stories, our synapses fire along the same lines as they would if we experienced those events in person. Maybe you can’t head out on a physical quest right now. Still, if you’re ready for a transformational experience, take on a challenge and stack your bedside table with epic stories like this one. Second, I return to this book again and again as a writer. I return to examine how Sharon Creech uses memory and back story. With these tools, she creates characters who leap off the page in three dimensions. As I’ve grown as a writer and teacher, I’ve become at least as interested–if not more interested–in what’s not on the pages of a story. I might include those “scenes around the edges” in the story. However, often they resonate invisibly behind the character’s actions and reactions. They’re the gems that transform figments of imagination into memorable, believable characters. This acclaimed bestselling Newbery Honor Book from multi-award-winning author Sharon Creech is a classic and moving story of adventure, self-discovery, and one girl’s independence. 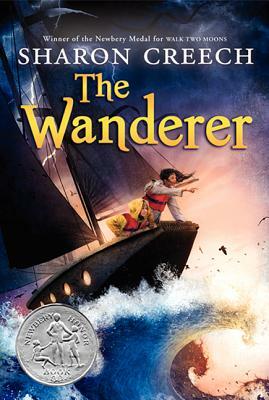 The Wanderer is a 2001 Newbery Honor Book.